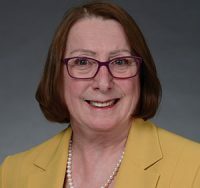 A sole practitioner from the northeastern Ontario community of Iroquois Falls, Law Society Bencher, Susan McGrath is well-known for being a dedicated advocate for sole practitioners, small firms, and lawyers working in remote areas, and for their access to quality continuing legal education and peer support. Ms. McGrath was elected as Chair of the LAWPRO Board of Directors in May, 2012, and acts as an ex-officio member of all committees. Since graduating from Osgoode Hall, McGrath has been an active member of her local legal community as well as contributing at the national level. She has served on her local legal aid area committee, including a stint as Deputy Area Director, has acted as a deputy judge for the Temiskaming Small Claims Court, and has served on the Personal Rights Panel of the Office of the Children’s Lawyer. She has served as President of the Cochrane Law Association (1983-1984), the Ontario Bar Association (1999-2000), and the Canadian Bar Association (2004-2005). As well, she has served in many capacities on committees of these and other legal associations. As a Bencher of the Law Society of Ontario, Ms. McGrath serves on the Hearing Panel, the Appeal Panel, the Government Relations Committee and the Priority Planning Committee. She also serves as Co-Chair of the Alternative Business Structures Working Group and the Vice-Chair of the Paralegal Standing Committee.